The full Fellside race route, including some navigation practice and looking for the best lines. Meet 9am at Fellside carpark (NY 304373), allow at least 2hrs. No further Interval sessions until Spring 2019. Instead an ‘Intervals Box’. The interval team have placed a ‘Intervals Box’ hidden at Bowscale tarn. The idea is to encourage members to continue their interval reps up to the tarn over the winter period. When you do a interval session up to the tarn, find the box and record your effort in the notebook. The location of the box is under stone behind large boulder just before the tarn, 1 meter to the left of path. We meet every second Sunday (what ever the weather) for social club runs. The start points, distance and routes change each meet. The aim of the club run is to improve stamina through steady pace and mileage increases, as well as to have fun. If you are joining us for the first time you contact us before hand – so we know to expect you and we can answer any questions you might have. You can do so via our Facebook page or from the Contacts on this website. That you are capable of running 6 miles of the road or trails. 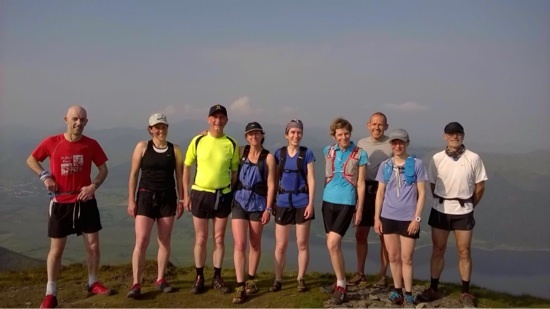 You accept the risks associated with Fell Running and that you are joining us at your own risk. That neither the Run Leader nor Northern Fell Running Club shall be liable to you for any injury, loss or damage of any nature to you or your property arising out of your participation in this social run.